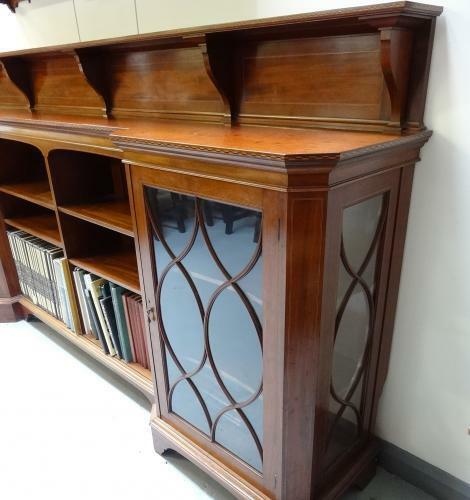 Superb wide dwarf part glazed bookcase/cabinet by Morris & Co, design attributed to George Jack; c1900. Of exceptional quality and design, with chequerband inlay to edging and trapezoid shaped shelving to glazed sections; which are also line inlaid. Grooves for plate/chargers to be displayed on top gallery. A very practical and stylish piece with presence. Stamped marks. Also illustrated in the Morris & Co catalogues at the time. Approx 98" wide and 48.5" high, 17.5" deep.